With the recent popularity of froyo aka frozen yogurt – cue Yeh!, Pinkberry and others – gelato seems to have taken a back seat. Places like Havre aux Glaces and Leo le Glacier in Montreal as well as La Dolce Vita and Paysanne Gelato in the West Island are part of the growing movement to bring it back. 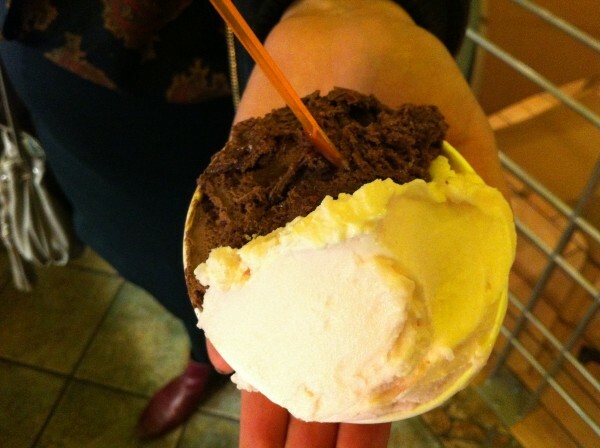 Every bucket of gelato is unique, from the color, the consistency and of course, the taste. Special care is almost always taken to decorate the flavor in a way that playfully accentuates its ingredients. 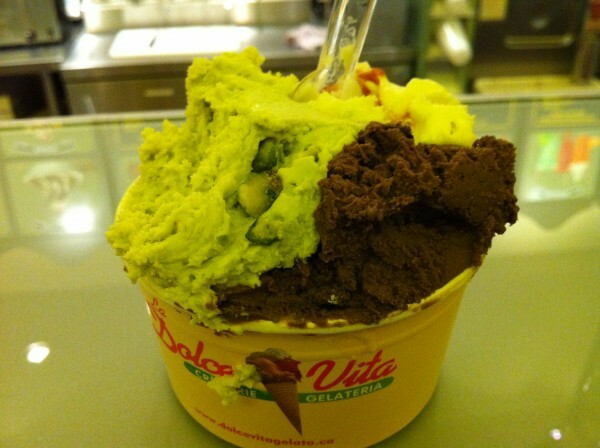 Take La Dolce Vita for example. 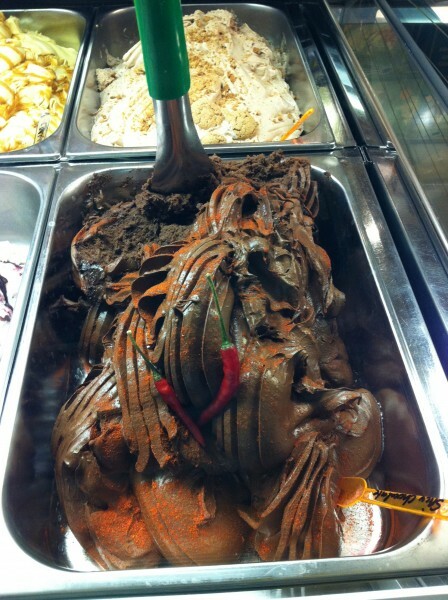 The spicy chocolate flavor had real pieces of hot red chili peppers and a generous sprinkling of cayenne pepper on top. 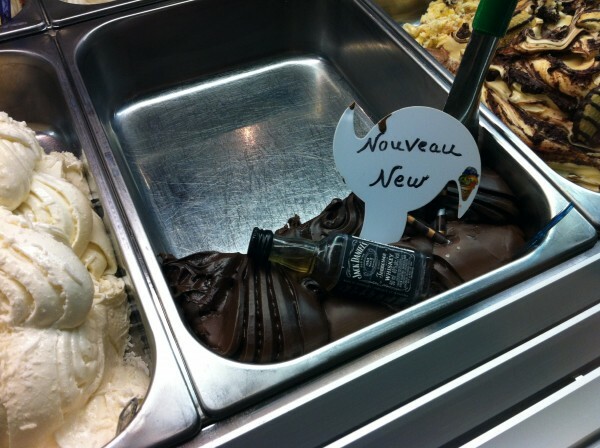 The Jack Daniels gelato was adorned with an actual mini bottle of the branded whiskey, the gingerbread flavor with gingerbread cookies and the smores with tiny marshmallows and crumbled graham crackers, drizzled with chocolate sauce. We stopped by for a snack after eating dinner at the Shahi Palace. 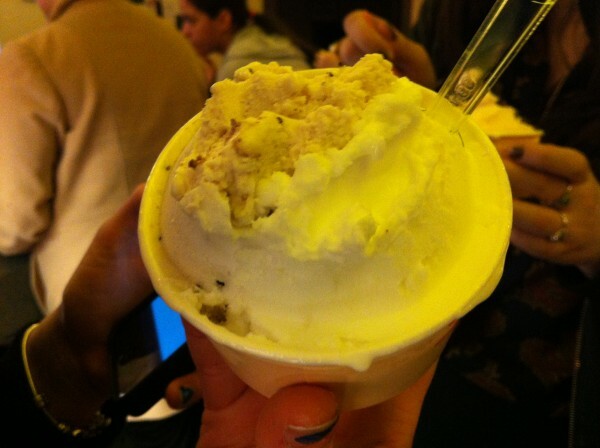 Even though it was around 5 degrees outside, we couldn’t resist getting the cold dessert anyway. We got a number of combinations: mint chocolate chip, lemon sorbet-cookie dough, pink grapefruit-spicy chocolate, pistachio-fleur de sel-baccio and strawberry mango. The indoor patio type area was cozy – perfect for families, casual dates and get togethers with a couple friends. Everyone seemed to really enjoy their respective flavours – the one complaint was that the spicy chocolate was a little too spicy. To the point where the burn would travel down into your throat and stay there for a while. 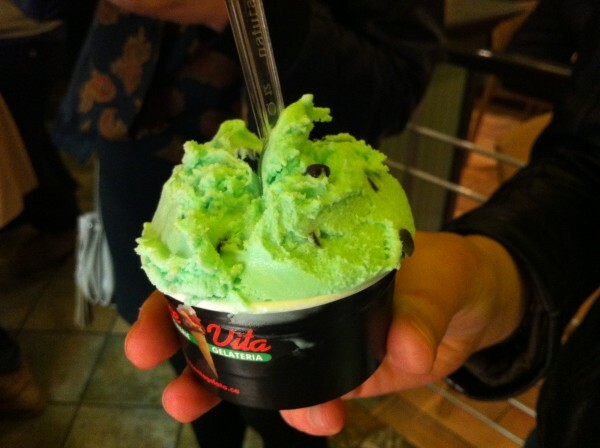 That was the only flavour left unfinished by the time we left. La Dolce Vita does a great job of representing the somewhat underappreciated treat, at least in Montreal. The wide array of flavours and beautiful arrangements are to be noted – I know when I walked in, I visibly got excited and apparently, my “eyes lit up”. If that’s true, I’m sure you’ll love it here too! Tags: Baccio, Cayenne Chocolate, Cookie Dough, Fleur de Sel, forkandtell, Friends, Froyo, Frozen Yoghurt, Gelateria, Gelato, Hot Pepper, Ice Cream, Jack Daniels, Kirkland, Lemon Sorbet, Mint Chocolate Chip, Montreal, Pink Grapefruit, Pistachio, Snack, St. Charles.